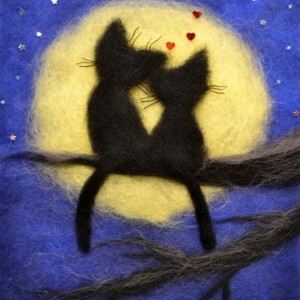 ORIGINAL WOOL PAINTING "ROMANTIC CATS". ABOUT PAINTING Picture size: 10 x 8 inches (25.4 x 20.3 cm). Painting is in a black frame. 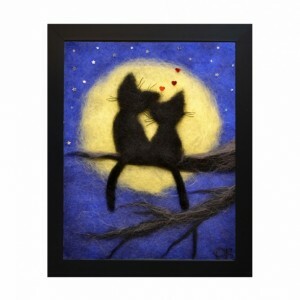 Overall size: 11 ¾ x 9 ¾ inches (29.8 x 24.8 cm). I also offer different frames and can switch to the frame of your choice. ABOUT TECHNIQUE To create this picture I used a unique technique called “Wool Painting”, also known as “Wool Watercolor”. 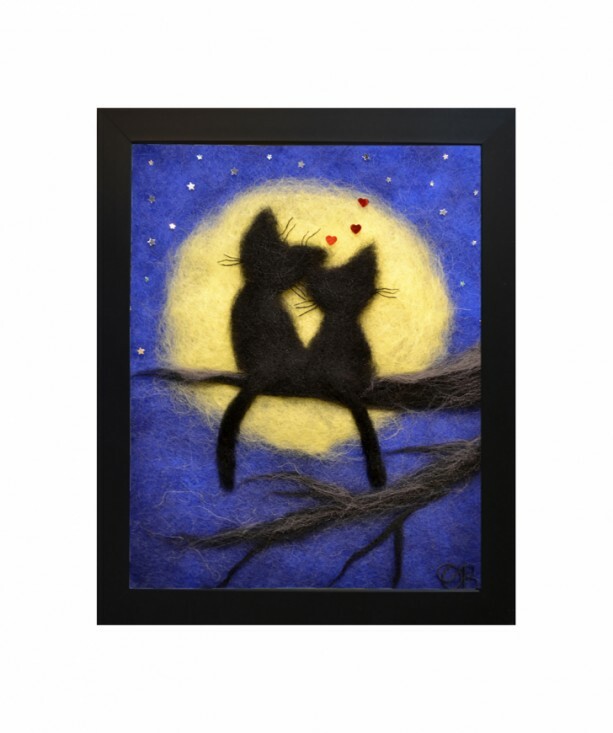 The picture is fashioned by layering wool fibers on a flat surface, weaving them a tiny bit, and then nicely framing it under glass. 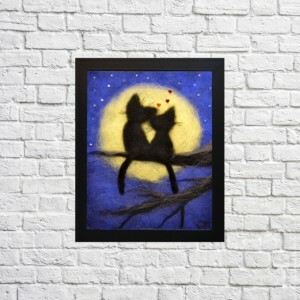 ABOUT CUSTOM ORDERS It is possible to customize a similar painting to your liking. I can make this picture to any size, with different frames, and matting options. Your painting will be created in same style, just with the changes you requested. After you order, I will start to create your painting immediately and will finish it within 3-7 days. Then, I will send you an image of the painting for your acceptance. The wool painting "Romantic cats" will be a wonderful and special decoration for your home or makes a great and original gift for your friends and loved ones! 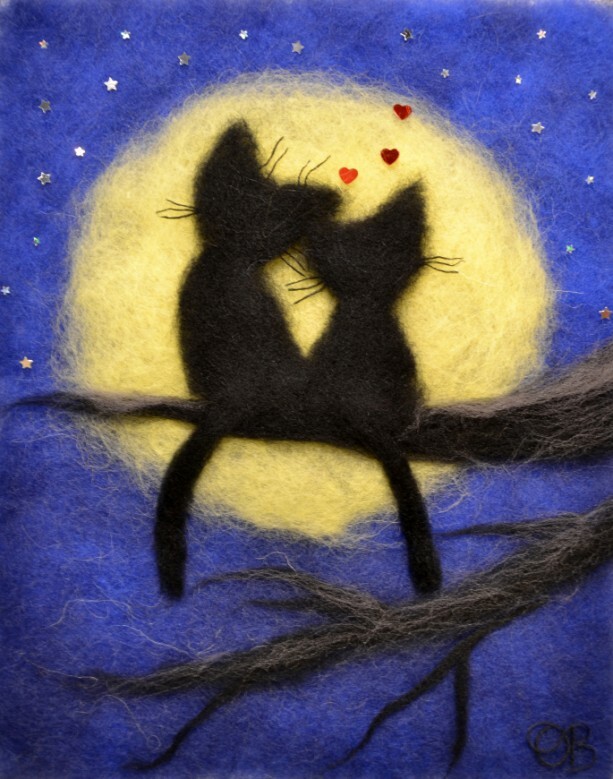 Each of my wool paintings is unique. Wool is a living material and the fibers always act differently when laid into place, so exact replication is impossible. The painting you receive may differ slightly from the image posted on the website. Please contact me if you have any questions.